How do you make *your* coffee? 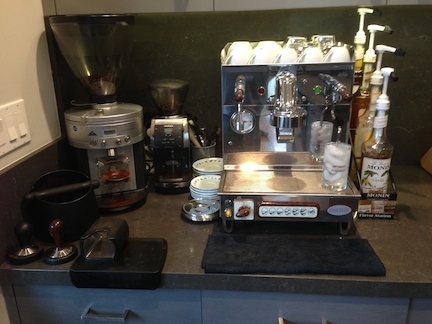 I have a commercial espresso machine at home – an Elektra “Sixties” T1, plumbed directly into the water supply, with a Mahlkönig K30 Vario commercial grinder (main), and a Baratza Vario consumer grinder (decaf). In my office, I have a “prosumer” pourover machine – an Ala di Vittoria “La Valentina” with a Cimbali MaxHybrid grinder. Nice Jason . Just my Bialetti and coffee from café Graffeo in SF. Ah. Good point about the coffee beans. I generally get my coffee from Red Bird Coffee in Montana (! ), but locally it’s either Catahoula or, sometimes, Ritual or Sightglass . . .
I’ll have to check those out . Thanks . I tend to like my coffee a little bitter .I like the espresso I was served in Italy . Café Graffeo is one of my favorites I have found in the city . I buy the bags here in Santa Cruz . Any places you like for a morning espresso when in S.F. ? I’m typically never in the City for morning espresso, living and working as I do in the East Bay. When in Santa Cruz, however, I prefer Verve to Lulu’s, though I profess a nostalgic attachment for the Santa Cruz Coffee Roasting Co. if I want drip/pourover. And, of course, I have fond memories of Café Zinho and the original Caffè Pergolesi . . . I don’t have time during the week but do at the weekend. Have a little Dualit espresso machine. Use a Krupps burr grinder. Colombiam/ Kenyan pea berry/ Ethiopian Yirgacheffe on a 2:1:1 ratio. Double espresso woth same quantity of steamed milk, no foam. It males a very fruity almost liquorice like coffee. Usually a pot of drip from my Technivorm Moccamaster all to myself, and mid afternoon, a pourover or French press pick me up. I can’t stand coffee away from home any more, like it too strong. I don’t drink coffee at all - love the smell, absolutely cannot abide the taste in any way, shape or form. I can even tell if you give me tea made in a pot that has previously held coffee, even if it uses a glass carafe. However my father drank it morning noon and night and I learned to make it for him over 50 years ago. Back then we had two percolators, an aluminum one with a glass knob on the lid that you could see the coffee squirt up through, and a granny-ware one - the black speckled enamel. We always called that granny-ware, though apparently its actual moniker is “granite ware”, LOL! Eventually my dad got a new-fangled electric Corningware percolator and he used that for literally decades. You should have heard the grousing when his workplace replaced all the old percolator types with Mr. Coffee types. But he eventually got used to it, though I doubt any of his officemates ever got used to his style of coffee - strong enough to get out of the pot by itself LOL! I make a pot using my Technivorm Moccamaster too, after grinding beans using my Rocky Rancilio. I also have a Nespresso Lattissima Plus but find the coffee it makes comparatively weak, so I don’t really use it. It’s nice to see, with all the references to Graffeo, Bialetti, French presspots, etc., that this board is not going to be bullied by the Third Wave Coffee Police. At this point, bathing in the glow of a loooooooooong experience with “Better than Hills Brothers from a percolator” coffees, I’ve become lazy and almost exclusively make coffee in my nearly a decade old Jura Capresso Impressa E9. When I bought my present house ten years ago, I gave serious consideration to installing a built-in super automatic espresso machine that was plumbed, but I could not find one that also grinds the coffee beans, tamps them into a puck, premoistens the grounds, then shoots steam through them to condense into fabulous espresso brewed coffee, then dumps the puck into a built in waste bin and rinsing itself ready for the next cup the way my Jura Capresso does. Spoiled soul that I am, I want a built-in that does all that, then has a drain built in with a garbage disposal to take care of the grinds and send them down the drain and on their way. In other words, does EVERYTHING! I have done the 'home barrista" routine in years past, but when I get up in the morning, I just want my espresso right away without me having to tamp a puck!!! But I do make coffee by other means that range from a Cona coffee maker to a Turkish copper cezve and a “toucan beaked” Arab dillat quhwa my uncle brought Saudi Arabia back in the early 1950s. I grew up with a mother who made the most abominable coffee in the history of the world! Her method: In an aluminum percolator place 1 heaping tablespoon of ground coffee for every 5 ounce cup of coffee you intend to make plus one for the pot, set it over a robust fire and when it has percolated for at least a full 20 minutes, serve. TOXIC! If she was alive today, it could be sold as a street drug! No, my mother did not deal, she was an English immigrant and recieved a “proper” Victorian set of rules to live by, which she did. But she did teach me to hate “coffee.” Is it any wonder? My salvation was that in the late 1950s I lived in Adana, Turkey, and through blind extremely good luck ended up with a chef housekeeper when my Kurdish housekeeper ran off with my best jewelry. (Hey, no slam against Kurds! Every ethnic group has its fair share of “problem people.”) Fatma, my “personal chef”, taught me how to roast my own green coffee beans over a low fire (stirring constantly), then to allow them to cool for at least an hour before grinding them in one of those brass Turkish hand mills that doesn’t grind coffee as much as it pulverizes it. I still have the Turkish mill she used but with time the cast iron burrs have rusted from humidity and siezed. I keep thinking about buying a new one online. For the last 55 years I have exclusively used whole bean coffees. In the 90s, I usually bought Douwe Edwards Aroma Rood whole bean coffee from Holland, but the supply has become more difficult to come by from Dallas in the last couple of years, and last time I bought some it was impacted by the coffee shortage (or whatever), didn’t taste as good as it used to, and was close to $40.00 a kilo! Pass! So I’m now back to either ordering whole coffee beans from specific coffee producers around the world and making my own blend, or trying a blend from an importer of varietal coffees. But that always has it’s own set of pitfalls. Last week I recieved a shipment of Java Taman Dadar organic whole bean coffee, but when I opened the hermetically sealed bag the coffee was burnt! As a result most of the coffee oils were dripping on the outside of the coffee beans and left an oil slick on my hands. NO WAY would I put that in a burr grinder to quite literally “gum up the works!” Not intended specifically as a plug for amazon.com, but that’s hoe I buy my whole bean coffees now because if the importer doesn’t want to give me a refund, Amazon will! 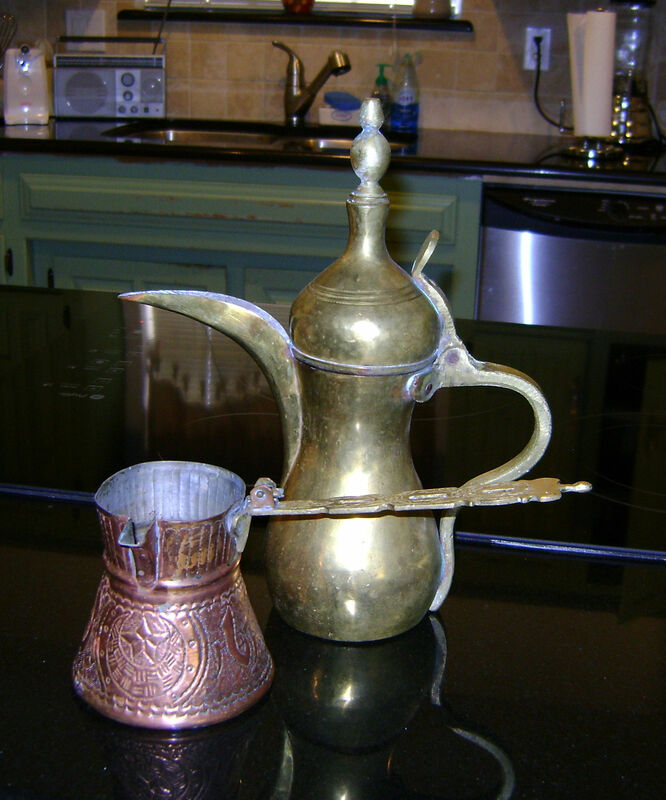 The difference between Turkish/Greek coffee (they are the same) and Arab/Saudi Arabian coffee is that in Arabia coffee making was often a formal entertainment among men (only! ), and the guest of honor was frequently asked to add a blend of spices of his choice to the coffee beans before the beans were roasted and ground. The spices were presented on an elaborate tray for the guest to choose from. The uncle who gave me the Arab pot was a frequent guest of sheiks for such ceremonies while he was a construction boss during the building of the original Aramco (Arab American Oil Company) shortly after WWII. If a guest didn’t mix up a pleasant formula, he wasn’t invited to do it next time. I guess Uncle Hank did a good job because one of the sheiks presented him with this pot after they were through drinking coffee and he brought it back to America when the job was finished and eventually gave it to me shortly before his death. It makes really good coffee, but I’m not a huge fan of spiced coffees. Please don’t anyone tell me that I’m “over the top.” (sigh) I’ve been this way since early childhood and I can’t seem to help myself! Honest! Years ago, when I read coffeegeek.com regularly, there were reviews of a $9 Sylvania or some such hardware store purchased pot that, when carefully tested and evaluated was providing the same performance as Technivorm Moccamaster, temperature, sprinkler and good taste wise.